There are three laps of the Montpelier circuit facing you. You've got a fully charged smartphone battery, half a pack of chewing gum, the lights are out, and are wearing an ironic Family Guy t-shirt. 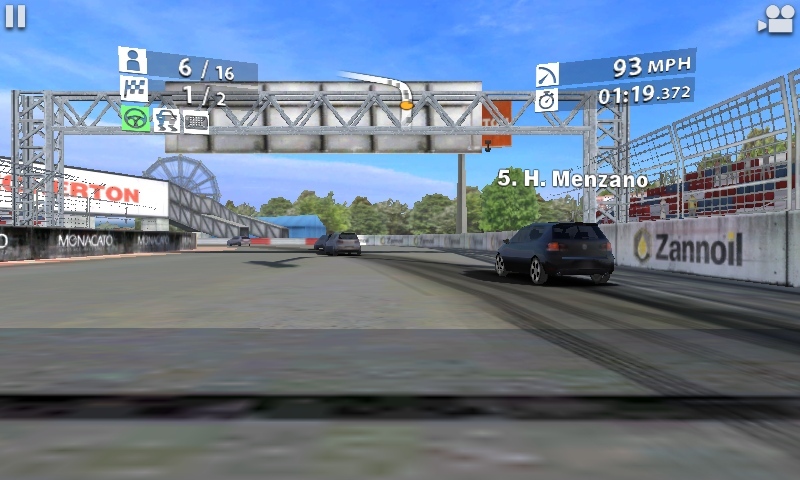 It's time to hit Real Racing 2 on Windows Phone! Real Racing 2 has been developed by Firemint, and while Nokia have just released the second iteration of the franchise as a Lumia Exclusive, Real Racing 3 is not long out for iOS and Android. 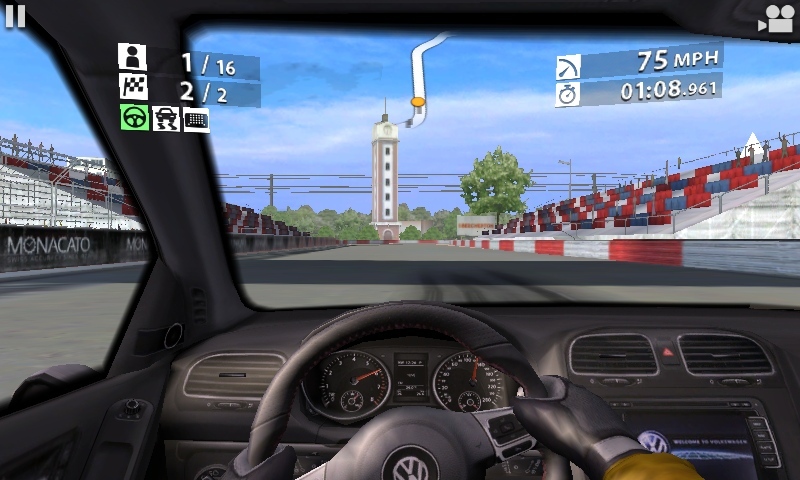 The good news for WP gamers is that we do have a version of Real Racing on the handset, and hopefully there will be enough sales to bring the next franchise title to the platform. Mind you, Real Racing 3 is packed full of freemium in-app purchases, I tend to prefer a game which has one payment and everything is potentially available to you. So Real Racing 2 gets a thumbs up from me in that respect. I want to start with the 'real' in Real Racing. While it is certainly a step up from your traditional arcade racer, it still feels like an arcade game with extra options, as opposed to a simulator style game. The difference between arcade and sim has blurred over the years as portable gaming has been played on rapidly evolving hardware - but there's still something in my gut that pins Real Racing as 'arcade'. Perhaps it's the simplicity of the driving model and the intelligence of the opposition? Go a little too far and you'll lose grip, slide out to the edge of the corner, and ultimately off the track and lose speed in the rough ground. Too cautious and you're not keeping the speed up as high as possible and will likely lose the current race. Real Racing 2 is very forgiving with the 'operational' window of turning, and countless times while playing I've simply out driven the competition by going the long way round on the outside of the curve - when the cars are the same model and type it should not be that easy. 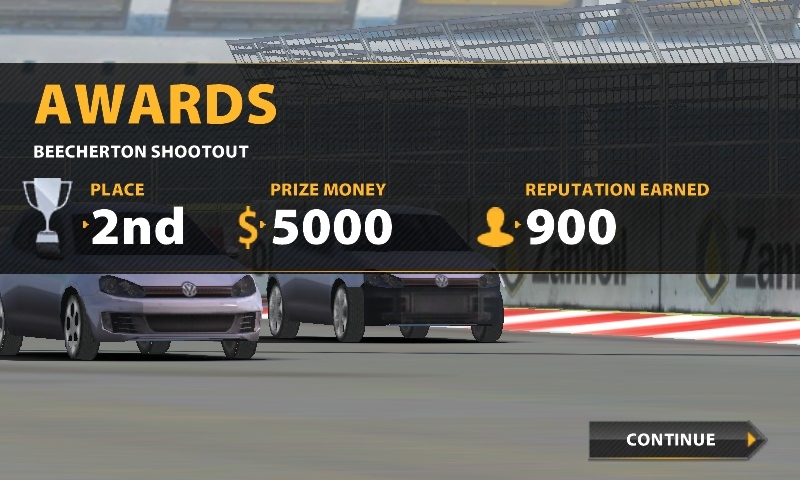 Which leads me to my other issue with Real Racing, and that's the computer AI. The fifteen cars you end up competing against are all very simple racers. They'll aim for the exact midpoint of a corner to act as the apex, they will always start out with a wide entry into any turn, with an equal balance of braking into the apex and accelerating way after the apex. Once I spotted that, it was a simple matter to see where the opposition were as they entered each corner, and then simply adjust my apex to either an early apex (trading entry speed for an opportunity to accelerate out the corner earlier), or a later apex (carrying more speed in for an overtake, but less acceleration as you leave, so you better have nailed that overtaking manoeuvre). I say simple, the skill in Real Racing 2 is not in knowing what to do, but in making sure you do it every single lap, and with as much accuracy as possible. The opposition are taking the traditional racing line every lap, and that's one of the fastest ways around the course. You're going to need to drive well, overtake cleanly, and preserve as much speed as possible as you drive. Even dropping a few miles an hour in each corner will add up as it takes time to accelerate back to the same speed as the opposition with the modified stock cars used in the game. This all requires a delicate touch on the controls, and Real Racing 2 has five different control layouts to choose from. Some of them using the screen as a left/right direction pad, and others using the accelerometers to let the whole phone act as a steering wheel. Given the accuracy that you're going to need after the first few levels, I can't see any control system other than the accelerometer being the way forward. Real Racing 2 is built around the career mode. Starting with a little bit of money you can buy one of two basic cars. 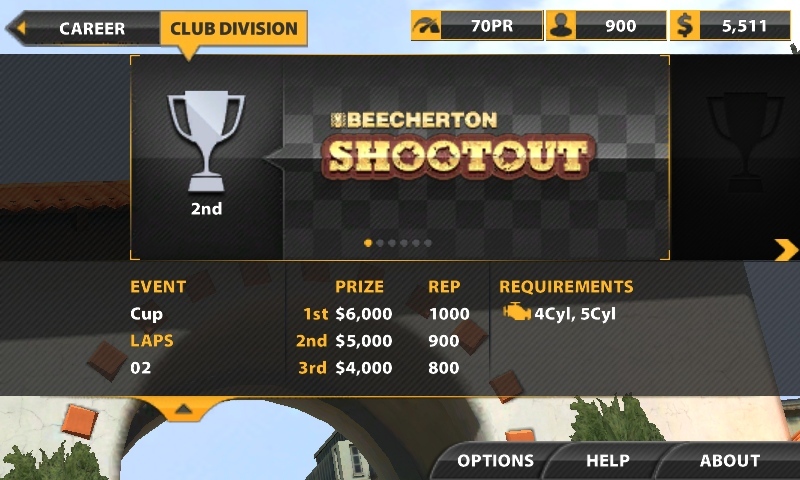 Take that racing, start earning prize money, and spend your winnings on improving your current car or buying a new one. As you work through the tracks, your success opens up other tracks, cars, and parts. It's a well used formula and Real Racing 2 does not deviate from your expectations in this regard. Perhaps that's the only issue I have with the title - there is nothing that feels truly innovative on offer. It's a racing game with a good (but not stunning) physics engine, it delivers the expected ways to play (you have quick races, time trials, and local Wi-fi multiplayer also on offer), and a list of Xbox Live achievements that are simply collections of 'finish first' in the races... which you're going to be doing anyway. But it does all of this really well, so while I struggle to give the title any credit in terms of originality, there's very little to fault in terms of implementation. The graphics are crisp and I've yet to see any shudder or slowdown (I'm playing on the Lumia 820). Everything is laid out and when you go looking for something, it's exactly where you expect it to be. That's clever design. 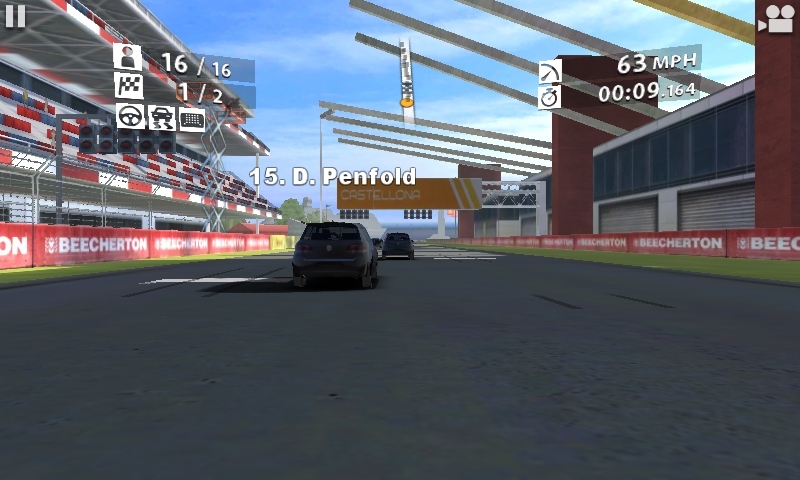 Real Racing 2 is a polished package, and since it was released last week I've been drawn back to it time and time again. Yes, there are some circuits where I really want to move up to the top step from second place, but that's never a hindrance to moving on in the game. It has that 'just one more drive and I'll win' addictive quality that a good mobile game needs, and it's relatively quick to move from launching the app to driving in a race. It might not be original but it does everything else with enough panache and style that not only am I going to recommend it, but I'm going to nudge it into the 90s 'mega' zone... with the caveat that this might be a 90 score for race game fans, it's more like an 88 for everyone else. But I think there's a little racer in every one of us - which means there should be a little racer in all our Lumia Windows Phones. That would be Real Racing 2.